In this paper, an adaptive control method is improved for airfoil model. By using energy method, the governing equations of the nonlinear 2-D airfoil model are obtained. As known, the system exhibits different behaviors at different speeds. For this purpose, flutter speeds are investigated and phase portraits of pitching are shown at critical speeds. Flutter for airfoils is such an enormous problem which have been considered. An adaptive control method is improved for minimizing the vibration at pre-flutter speed, flutter speed and post-flutter speed regimes. To show that the controller system works, controlled and uncontrolled airfoil model are simulated simultaneously. Results of these simulations are demonstrated graphically at the conclusion part. Due to the increasing power requirements of the electronic components, which in many cases leads directly to increasing production of heat flux is the topic of the electronic cooling still current. In order to maintain their quality and lifetime as long as possible is the heat dissipation of electronic components solves by sophisticated technology such as a heat pipe technology. The paper deals with the cooling of power electronic component by loop thermosiphon. The loop thermosiphon is one from many proposal of heat pipe devices. Object of the paper is design and construction of the device to provide heat removal from the electronic component, thermal visualization of loop thermosiphon during operation, evaluation its cooling efficiency and research results interpretation. Paper describes function principle of loop thermosiphon, testing of the loop thermosiphon function and measurement of cooling efficiency in dependence on input electric power of the electronic component. The findings from measurement of loop thermosiphon cooling efficiency are compared with natural convective alumina cooler on the end of paper. The main object of the work is thermal visualization of heat flux transport by working fluid in loop thermosiphon from evaporator to condenser evolution. The result of the thermal visualization loop thermosiphon give us how the hydrodynamic and thermal processes which take place inside affect overall heat transport at start-up and during loop thermosiphon operation and distribution dynamics of the working fluid in dependence heat load. Construction of condenser plays important role for efficient operation of energy systems. In this system a heat pipe is utilized for heat transfer. The condensation part of the heat pipe is situated on top of the heating zone. The condenser is placed in the heating zone and is used for efficient heat transfer from one medium to another. The thermal oil is used as cooling medium in the condenser. This paper analyzes the effect of different operation condition of thermal oil to thermal performance. From the collected results it is obvious that the larger mass flow and higher temperature cause better thermal performance and lower pressure drop. Electron beam lithography (EBL) is one of the few “top-down” methods and EBL is becoming increasingly widespread in R&D and small volume production due to its flexibility and mask-less nature, very high (sub-10 nm) resolution and accuracy and in many cases EBL is the only possible alternative. In this paper, obtained experimental and simulation results for EBL nano-patterning using the high-resolution electron beam resist Hydrogen Silsesquioxane (HSQ) are presented and discussed. The influence of EBL process parameters such as exposure dose, resist thickness and development process conditions on the obtained developed images is studied. The applied simulation tool for the resists’ characteristics evaluation is suitable for a precise control of obtained image dimensions in the resist applied as a masking layer for nano-patterning. This investigation and simulation of the characteristics of the studied e-beam resist aim to improve the resolution of the nano-dimensioned electron beam lithography and results for nano-lithography applications are also presented. In this article the authors examine the nature of standardized work and its place in TPS (Toyota production system). Standardized work is one of the most powerful but least used lean tools. By documenting the current best practice, standardized work forms the baseline for kaizen or continuous improvement. As the standard is improved, the new standard becomes the baseline for further improvements, and so on. Improving standardized work is a never-ending process. Establishing standardized work relies on collecting and recording data on a few forms. These forms are used by engineers and front-line supervisors to design the process and by operators to make improvements in their own jobs. In this workshop, you’ll learn how to use these forms and why it will be difficult to make your lean implementations "stick" without standardized work. The benefits of standardized work include documentation of the current process for all shifts, reductions in variability, easier training of new operators, reductions in injuries and strain, and a baseline for improvement activities. The main emphasis placed on identifying the three elements of standardized work, monitoring of any process to detect potential improvements and milestones in process improvement. Based on research conducted in Bulgarian industrial enterprises are given the attitudes of managers to use this tool to improve processes. Presented is a method for determining the tolerances in geometric precision of machining centers in working conditions. The method is based on the implementation of coordinate measurements with contact measuring head. The measurements are performed on special prismatic detail – caliber attachable with relatively low grade precision guidance on the machine table. In the publication are presented experimental studies and the results obtained. The conclusion is that the developed method, the mathematical model and caliber are suitable for the determination of some basic elements of geometric precision of machining centers in working conditions. At the same time provides a satisfying user accuracy, cost and performance. In the publication are presented studies to determine the accuracy of the group approach in calculating the cost of technological engineering products. For this purpose, the cost price of a specific item is calculated by applying the developed approach and the group is compared with the actual cost. 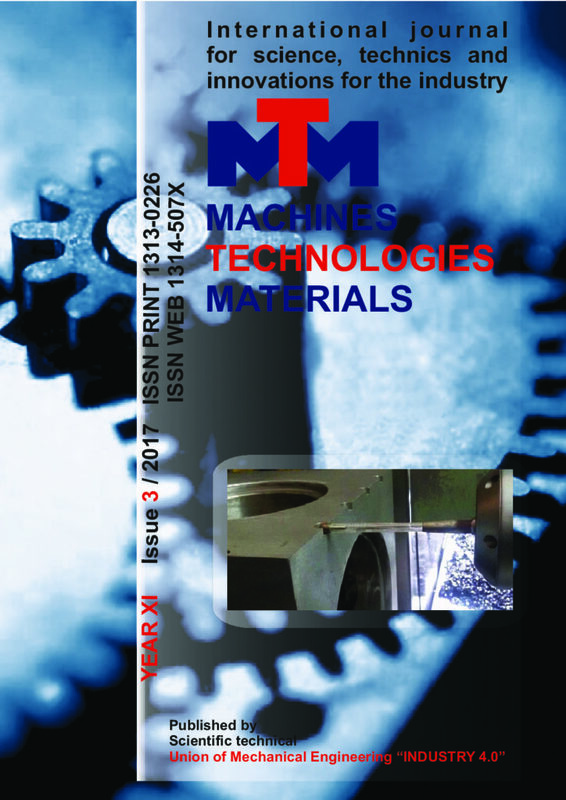 The results obtained show that the use of group approach enables a comparatively fast and sufficiently precise calculation of the technological cost of machine products. With the help of computer simulation in the DEFORM-3D software, there was performed a virtual full factorial experiment of the process of shear drawing. In the course of the experiment, the effect of independent parameters (drawing speed, die rotation rate, die angle and friction factor) on the strain intensity was evaluated. As a result of the experiment, a regression equation was derived and the most significant individual factors and their combinations, influencing the response parameters, were determined. Also, comparative results were presented for the processes of regular drawing and shear drawing. It was demonstrated that the process of shear drawing has a higher efficiency from the point of view of strain intensity. This study opens up new opportunities for developers and end users to realize an excellent facility of electromyography technology interfacing with different mechatronic devices. The article provides a brief review of the various ways for controlling different types of devices by using human-machine interface with help of electromyography (EMG) technology. How to register EMG signals from human muscular activity and evaluate the electrical potentials with the help of hardware and control the artificial limbs. South Caucasus with its geopolitical position and diversity of natural resources is a unique region in the world. A concrete expression of this fact is the EU’s “TRACECA” project, which binds the Central Asia, Caspian and Black Sea basin states to one another. This line the Eurasian freight logistics corridor runs through the South Caucasus, which guarantees the economic growth and stability in countries of the region. Strengthening the transit capacity of the South Caucasus countries and improving overall competitiveness of transport corridor will be contributed by the development and formation of a new concept of a single transport and logistics system – the regional customs logistics. In order to allow fast, safe and efficient movement of commodity flows through the South Caucasus transport corridor, the regional customs logistics should create a single standard of customs processing of freight. This can be accomplished within the “ASYCUDA World” program by creating the appropriate module. All European countries including Bulgaria need to promote the entrepreneur spirit through young people, to encourage the creation of new business and to stabilize the institutional and culture environment for innovations. The encouragement and advancement of present and future entrepreneurs (mostly young people) is a basic mechanism to revive the Bulgarian economy and ground the post crisis development. Using a survey is made an investigation through young people with bachelor degree in economics and their readiness for entrepreneurship. Findings from this study indicate that there are many challenges and problems that are an obstacle to start business in Bulgaria but many young people have motivation for entrepreneurship. The contemporary lifestyle leads to rapid increase of number of motorized traffic participants thus, there is a need of traffic planning. The task of any modern traffic planning is creating such road network that will be reviewed, safe, with appropriate capacity, economical in terms of exploitation costs and cost for building, also designed to be compatible with structure of the city. In the field of traffic engineering exist a wide range of software packages for different purposes, with different performance and quality. One of them is world leading software package for traffic analyzes and forecast of transport demand, PTV Vision VISUM. In this paper will be represented the steps of the methodology for calculation of transport demand, starting from setting the background, drawing the traffic network until the forecast using an appropriate software package PTV Vision – VISUM in which the base is standard four step transport demand model. Dry sliding wear behaviour of unreinforced Al4%Cu and Al4%Cu – SiC composites was investigated. Composites containing 10-50 vol.% SiC were obtained via hot press by using Al, Cu and SiC starting powders. Wear tests were conducted by an oscillating tribometer having a 6 mm diameter alumina ball. 2 N load was employed and sliding span was 5 mm with a total test distance of 6 m. Wear tracks were examined by an optical microscope, track cross sectional areas were determined by a profilometer and wear rates were calculated. It was seen that the wear track formed on the unreinforced sample was much larger and deeper than the ones on the composite samples. Wear mechanism was suggested to be initially adhesive and then adhesive and abrasive. The wear rate of unreinforced sample was about 11×10-3 mm3/N.m. Wear rate was seen to decrease abruptly with the addition of SiC particles into the matrix alloy. When 10 vol.% SiC was used, wear rate decreased to 1.5×10-3 mm3/N.m. The lowest wear rate was achieved in the sample containing 30 vol.% SiC, 0.5×10-3 mm3/N.m. Waste materials have been an increasing problem every year. Disposal of waste materials has presented very serious problems to the human community in the world. Currently, some research has been studied to the recycle of different wastes in concrete. Recent study is focusing on the usage of a unique blend of recycled polypropylene and copolymer macro fibers (RPCMF) designed specifically for concrete mixture. The different weight of RPCMF is mixed in concrete to in order to investigate the effect on mechanical properties. By adding RPCMF obtained a satisfactory improvement on cracking control, compressive strength, flexural strength and also tensile strength, Moreover, compressive, flexural and tensile strength was positively affected by the addition of RPCMF for some mixtures. More percentage of weight fractions added gives high result in tensile strength. However, the workability of the concrete reinforced with RPCMF was negatively affected.